We performed optical spectroscopic observations (R about 400) of Nova Lup 2011 on 2011 Aug. 16.6 at Bosscha Observatory of Institut Teknologi Bandung using a 20-cm Schmidt-Cassegrain telescope with SBIG DSS7 spectrograph. 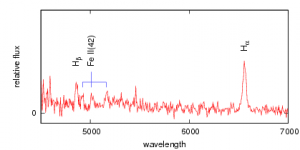 Our spectra exhibits strong H-alpha, H-beta and Fe II multiplet emissions, suggesting that the nova is a Fe-II type classical nova. These results are consistent with previous reports in ATel #3536 and #3540. P-Cygni profiles disappeared for any lines and the FWHM of the H-alpha emission is about 1700 km/s. This observation program is performed by the collaboration of Koyama Astronomical Obs. and Bosscha Obsrvatory, Institut Teknologi Bandung, Indonasia. We performed low-dispersion optical spectroscopic observations of a Possible Nova in M31 (CBAT name is PNV J00444794+4138096 ) usign 1.3m Araki telescope with LOSA/F2 (R~580@H-alpha) on 2011 August 07.6UT. 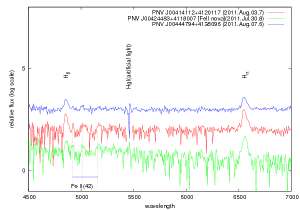 Our spectra of the object (the blue spectrum) exhibits broad H-alpha and H-beta emission lines with FWHM about 2000 km/s. Although other emission / absorption features are invisible in our spectra, such large expanding velocities suggest that the object would be a classical nova. 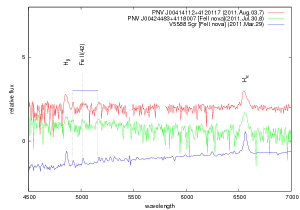 We performed low-dispersion optical spectroscopic observations of Possible Nova in M31 (= PNV J00414112+4120117) using the 1.3m Araki telescope on 2011 August 03.7UT. 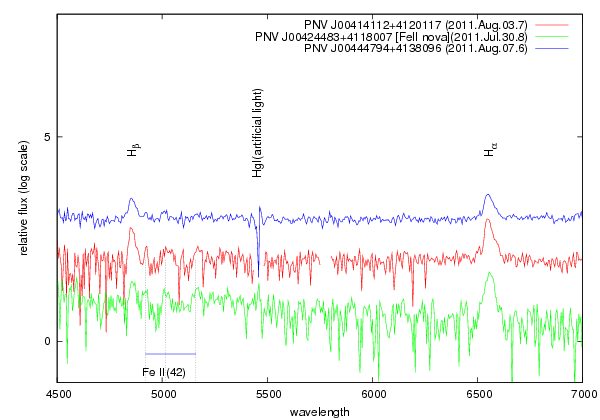 The red spectrum in the figure shows our preliminary spectrum of PNV J00414112+4120117. Our spectra of PNV J00424483+4118007 and V5588 Sgr are also shown. 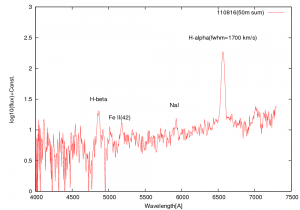 The spectrum exhibits the broad H-alpha, H-beta emissions (FWHM about 1600 km/s) and Fe II multiplet emission features, which suggest that the object is a Fe II-type classical nova after the maximum. 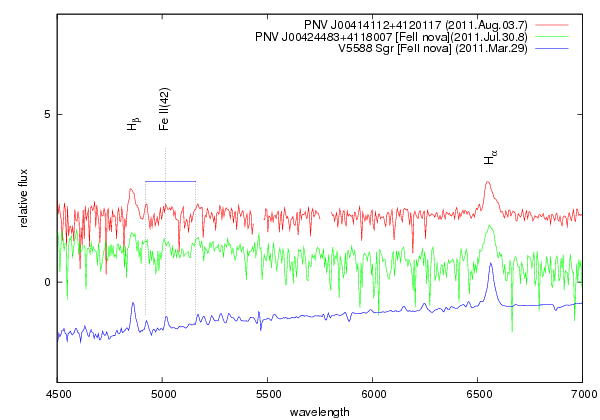 We performed optical spectroscopic observations of PNV J00424483+4118007 using 1.3m Araki telescope with our low-dispersion optical spectrograph (LOSA/F2: R~580@6000) on July 29 and 30 UT at Koyama Astronomical Observatory, Kyoto Sangyo University, Japan. The figure shows our preliminary specum on July 30. 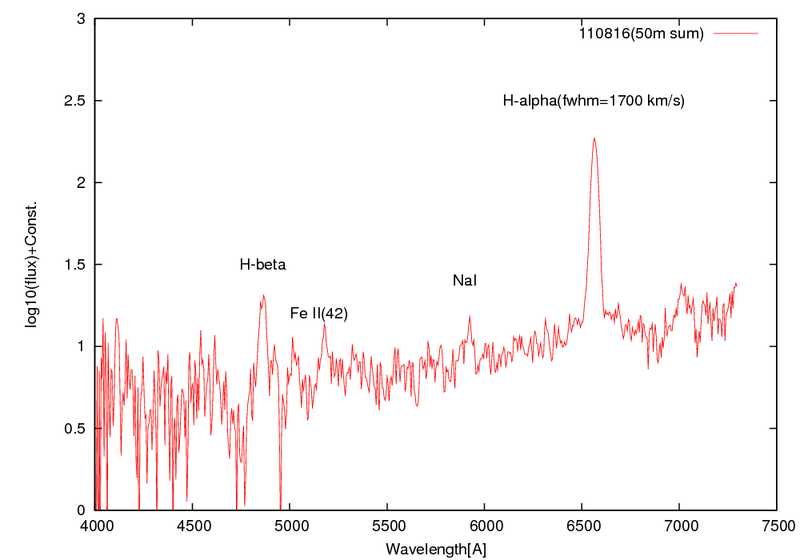 We detected a broad H-alpha emission line with FWHM = 1800 (+/- 200) km/s in our preliminary spectra on both nights. In spectra on July 30, H-beta and Fe II multiplet emissons were seen. Although this object is very faint (CCD~17), our spectrum shows a conitmuum light accompanied with a blue-trend. This means that the interstellar reddening toward to the object would be small. These results suggest that PNV J00424483+4118007 is a 'Fe II'-type classical nova in M31.